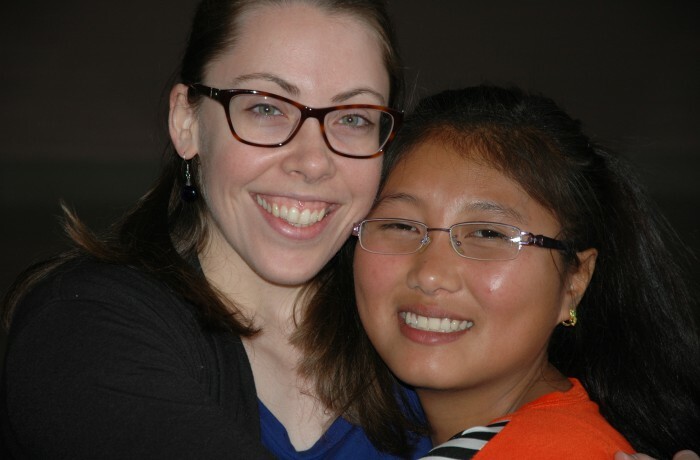 Meet Ching Mal Sawmi, pictured here with our music teacher, Sarah Burnell. Her friends call her Sawmi (pronounced So Me). Sawmi is one of the many amazing success stories at Angels' Place. When she was eight years old, she was living with an aunt and going to a state school that did not nurture her bright intelligence or love of learning. They were so poor her aunt could not even afford to buy Sawmi pencils. When her aunt heard about Angels' Place and the emphasis on education she packed Sawmi up for the 300 mile trip to Churachandpur to apply for admission. Since coming to Angels' Place, Sawmi has excelled at school and at life. She has taken on a leadership role with the younger children and helps the staff with many responsibilities, like sewing, cooking and taking care of visitors. She is a member of the choir, plays badminton and loves to perform dances of her tribe and cultural heritage for guests. Even though she was a year behind in school due to her rough start in life, she has successfully completed her course of studies with exceptional achievement. She has been accepted to Rayburn College where she will complete her last two years of education before going to University. Her dream is to pursue her masters degree in social work. When asked why this path, she simply responds... "to help people". We are so proud of Sawmi and tremendously grateful to her sponsor and all of our donors who made it possible for her to pursue her dreams. UPDATE: As of May 2018 Sawmi has completed her Freshman year with honors at The Ohio Valley University in the USA, thanks to her generous sponsors who made it possible. Read more about her continuing story in our 2017 Newsletter. If you would like to learn more about how to help children just like Sawmi, visit our Ways to Help page.